Operating a computer and its accessories requires you to see the screen and follow instructions. It is quite easy for us as we have got used to it. However, have you every thought how blind people would use computers? Fortunately, there have been many tools and utilities invented that aid visually challenged individuals to use computers in a way that normal people do. These tools are referred to as adaptive computer technology. Read on, to get to know more about computer devices for the blind. As the name suggests, screen readers are adaptive applications that do the job of converting text on the screen to audio. These are able to read web pages, menus, dialog boxes, and other computer visuals. Some of the best products are JAWS, Window-Eyes, Dolphin Supernova, and ZoomText Magnifier/Reader. There are even other products known as optical character recognition apps which read out content from the screen, with the user being given the freedom to control the speed of reading. Good OCR applications include ABBYY FineReader, LEADTOOLS, OmniPage, etc. 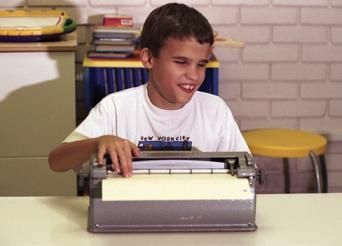 A Braille embosser, also referred to as a Braille printer, is an impact printer that is used for the purpose of converting text to an embossed surface on a special type of paper that can be felt and read by a blind person. Normal paper can also be used, but only on high-end embossers. The price of good Braille embossers start from $2,000 and may go in several thousands, as per the need. You can go in for models such as Thomas Pro, Marathon, Romeo Attaché Pro, Viewplus Elite 150, Emprint SpotDot, just to name a few. This is another assistive device for blind people from the Braille system. The Braille computer monitor is one with rectangular cells arranged in rows and columns of dots. The up and down movement of these dots is controlled by electromechanical impact drivers and elastomeric cords. These monitors can also be used as output devices for working with screen readers. Earlier, refreshable Braille display technology was used, which used the same functioning concept for helping blind people feel and read matter on display. Speech control software is found in almost all computers and standard electronic devices. This technology uses voice commands to interact with and control the interface on screen. The computer should necessarily have a mic and speaker system for inputs. It enables users to select and browse through files and folders, draw pictures, type, and so on. On a PC with Windows OS, the person will have to use the Accessibility Wizard to customize this interface; whereas for Mac users, Universal Access is the option. One of the most commonly used computer devices for the physically challenged in sight is magnification software. This application is not for the totally blind but, those who have a weak sight and are considered legally blind. As the name suggests, these software magnify text and pictures on the screen up to many times. Some applications even have the feature of changing color of the matter for a clearer view. You have good choices such as MAGic Professional, Supernova Pro, WinZoom, ZoomText, and LunarPlus Enhanced Screen Magnifier. You can buy these apps in just under a $1,000. These computer assistive software and hardware have certainly proven beneficial for visually challenged individuals to perform computing tasks efficiently. Using touch and audio resources collectively really helps blind people operate computers more effectively. A good example can be of using a Braille computer monitor with a speech reader on a speech control interface. you're reading my article in my blog Computer Devices for the Blind and you can find something Computer Devices for the Blind ini dengan url http://technologyfactory.blogspot.com/2011/11/computer-devices-for-blind.html, you can publish and copy paste for you Computer Devices for the Blind it's very use full Computer Devices for the Blind sumbernya.